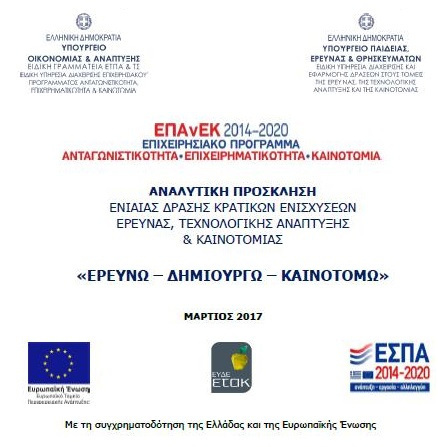 The Single RTDI State Aid Action “RESEARCH – CREATE – INNOVATE” support measure is funded by the Operational Programme Competitiveness, Entrepreneurship and Innovation 2014-2020 (EPAnEK). – Connection of academic research with market needs and economy. In an effort to decrease the high level of mortality but also to increase the life quality level of neural disease patients, a physical tele-rehabilitation system / product is proposed. Using appropriate equipment, targeting in Parkinson’s and stroke recovery, the system aims to simplify and automate the patient rehabilitation, to increase the quality level of patient monitoring as well as to allow for precise rehabilitation information gathering for medical experts. The proposed system will be deployed in rehabilitation centers and at home, capturing and evaluating the physical exercising of neuro patients even when they exercise with therapy assistant. Sensors and devices will be utilized to provide vital signs to the system (e.g. heart-rate, blood pressure, etc.) in real-time, while a special belt will be developed for Parkinson’s disease patients, detecting and getting over gait “freezing” episodes. Through exergaming/class, which will serve as a user-friendly, attractive virtual environment, the rehabilitation progress and the vital signs, gathered with the sensors (Internet of Things – IoT), will be stored in the cloud, where an artificially intelligent decision support module will evaluate these data in order to personalize and adapt the patient rehabilitation programs, both in short and long term. Clinical interfaces will be offered to allow for high level rehabilitation progress monitoring. The proposed system will be evaluated through pilot clinical tests, one for Parkinson’s disease patients and a second for stroke patients, which will take place in rehabilitation centers and at home. The clinical tests will be realized in two temporal phases, while technical and clinical support will be provided during the tests. The rapid growth of information and communications technologies has transformed the way in which digital cultural content is created, disseminated and maintained in recent years. As a natural consequence is the creation of the “Virtual Museum”, a new form of multimedia applications that convey the experience of visiting a museum or narrating cultural content through digital media and introducing the concept of “virtual tours” even without being located visitor to the natural space of a museum. This project is geared towards an innovative concept around this philosophy offering modern creativity and innovation services through a modern tele-touring environment. The innovative technology that will be developed will use portable enhanced (enhanced) reality technologies as well as advanced e-services to turn the usual passive tour into a museum, an energetic, personal and interactive experience. The results of the project will be used commercially both as a virtual product of virtual tours and as individual products. More specifically, the partnership considers that the following results will be available for commercial exploitation after the end of the project: a) the creativity and synthesis tool of multimedia information for professionals and non-guides; b) the framework for creation of remote individualized (individual and / Or group tours; c) technologies for 3D rebuilding presenters and integrating them into virtual cultural environments. The above will be offered either as a total package of services or as individual subsystems according to the requirements of the organization concerned. Virtual-Guide-Tours aim to offer exciting and entertaining experiences outside of exhibits by digitally digging the range of traffic to each museum space and acting in addition to the physical space of cultural operators. This will remove the space constraint and allow the display of exhibits that are stored, as well as the possibility of presenting narratives in order to attract visitors to the actual museum.